The borders for District 5 broke free of the train tracks, but some question whether the district can be a cohesive community. UPDATE: 10:30 a.m., Nov. 20: Keon Hardemon will be the next District 5 Commissioner for Miami. In the runoff election against Rev. Richard Dunn Tuesday, Hardemon received more than 72 percent of the vote. He will take office on Nov. 27. In advance of Tuesday’s elections, City of Miami voters are reading up on the candidates, their platforms and track records, figuring out whom to give their vote to. But in the process, some constituents may discover they’ve been brushing up on candidates from the wrong district. After the 2010 census, there were too many people living in District 2, so a generous section of the ritzier Upper Eastside was handed over to historically low-income District 5, transcending the railroad-track divide, at least in principle. 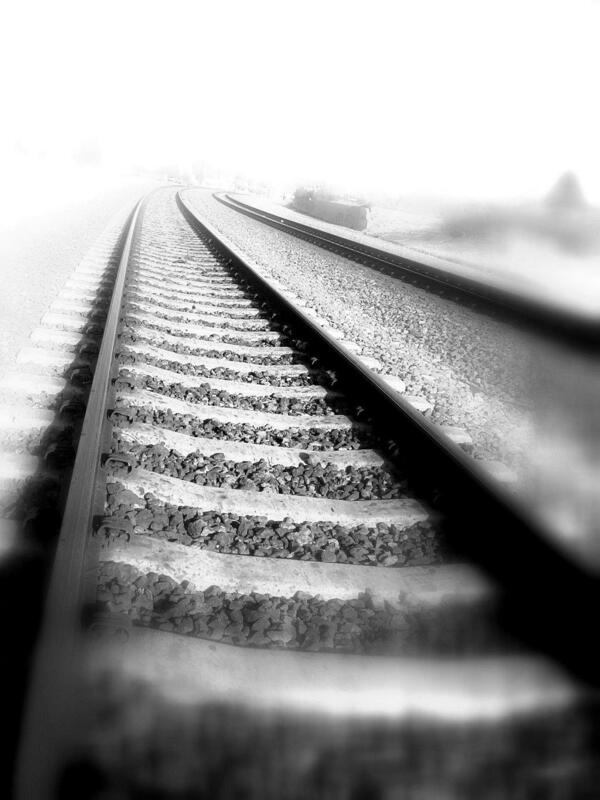 Historically, all over the country, railroad tracks have been physical boundaries between black and white people. In Miami, railroad tracks were used for drawing voting districts. Miami City Commission District 5 -- which contains Overtown, Liberty City and Little Haiti -- used to only go as far east as the tracks. Although the virtual lines have been moved, there is still a communal divide. The move to District 5 was resisted by Upper Eastside residents such as Bob Powers, a disabled veteran. He has been involved in community organizing in his neighborhood for more than a decade. “Community is the single most important thing,” he said, adding that the move divided his community in half. Powers says the difference in needs in the old and new sections of District 5 concerns him. The disparities stem partly from the fact that historic District 5 is made up of predominantly black and lower-income residents, whereas the Upper Eastside is mostly home to middle-to-higher-income whites and Latinos. 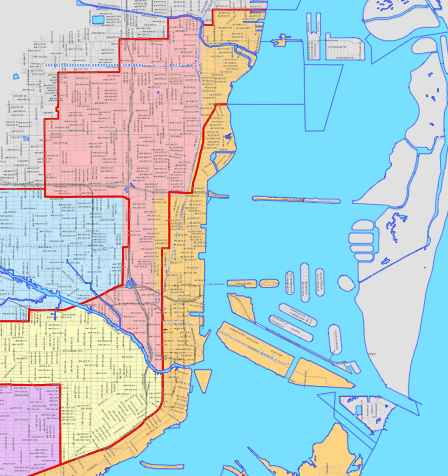 District 5, in pink, with its new and old boundaries. The redistricting has caused some controversy. "[The District 5 commissioner’s] main objective is to bring jobs into the city and things of that nature. It’s not maintaining neighborhoods and taking care of [them]," Powers said. "If you don’t have people who are constantly advocating for your district, you don’t get your streets redone, you don’t get your sidewalks redone, you don’t get those kinds of things to happen." But historian Marvin Dunn thinks the new District 5’s goals will not be any different. He says, indeed, jobs are a primary concern for the incoming commissioner. "[But] beyond that, the concerns new constituents may have would be very much aligned with the current residents of the district: get the thugs off the street, protect us from crime, have a professional police department that enforces the law with fairness, keep the community clean, pick up the trash,” Dunn said. He concludes those priorities wouldn’t change regardless of whom is in the district. Powers, who is white, claims many people have suggested the reason Upper Eastsiders fought redistricting were partly racial and socioeconomic differences. But Dunn thinks the addition of more affluent people could help the community greatly. Benji Power, an Upper Eastside resident trained in urban planning, agrees. Although numbers were the impetus for redrawing the lines, Miami seems to be moving away from the idea of having seats for one ethnic group. “If these changes had been proposed in 1980, there would have been blood flowing from city hall,” Dunn said. But the communities that made up District 5 have changed so much that there is no longer a single political agenda, and the constituencies have become multi-racial and multi-ethnic. Here are the most-recent demographic maps of the white, black, and Hispanic population. Here is a detailed, downloadable map of the new and old districts. In the widget below, select a category to see a map of District 5 divided by income, rent, wealth and poverty. Hundreds of Florida Democrats fawned over former Gov. Charlie Crist this weekend at their annual conference as the onetime "Reagan Republican" campaigned relentlessly, receiving a hero's welcome more than a week before he officially announces his candidacy for governor. The Florida Democratic Party's conference gave Crist, who wasn't an official speaker, a platform to do what he seems to love best --- pose for photographs, whisper words of encouragement and linger long enough with admirers to create a logjam wherever he went. The year was 1995 and the place is on the cusp of a dilapidated downtown Miami at Northeast 14th Street and Biscayne Boulevard: parking lots located next to empty lots and patches of dusty grass that were home to those who had no other -- prostitutes, drug addicts, alcoholics and those who had simply given up. It was back when the euphemism for Miami was South Florida, because like many a crime-ridden city, very few wanted to claim the name anymore. Next Tuesday's primary will be the first election since redistricting under anti-gerrymandering rules changed all of the political maps. The process made, changed or destroyed some political careers in the Florida Legislature, and not every one is sure the redistricting process accomplished its goals. 11/05/13 - Tuesday's Topical Currents is an open-phone discussion with journalists Dan Ricker, publisher of the Watchdog Report, and investigative reporter Dan Christensen, who edits the Broward Bulldog. City of Miami Mayor Tomas Regaldo appears to be a shoe-in for reelection Tuesday . . . yet has still spent campaign funds as though he were seriously challenged. UPDATE 11:15 a.m. Oct. 31: In the latest development of the City of Miami's request to revisit the Pottinger case, Federal Judge Federico Moreno has officially called for an evidentiary hearing. This means both sides will present data and witnesses who will attest to whether the landscape for the homeless in Miami has, in fact, changed. The judge has the ability to reopen the original settlement if the change is significant enough.